Dr. Margaret Schedel had wanted to flip her classroom before the whole MOOC concept starting sweeping SBU, so it seemed like a plan to try not only flipping her class, not only by recording the standard lectures and using class time to work on the hands-on parts of computational arts, but also by making those lectures open to a wider audience using Coursera. This allowed for a massive group of students to synchronously go through the class with her own face to face students. Grading is accomplished through simple computer grading assessments and through peer assessments of larger projects. A large amount of student interaction is accomplished via forums. 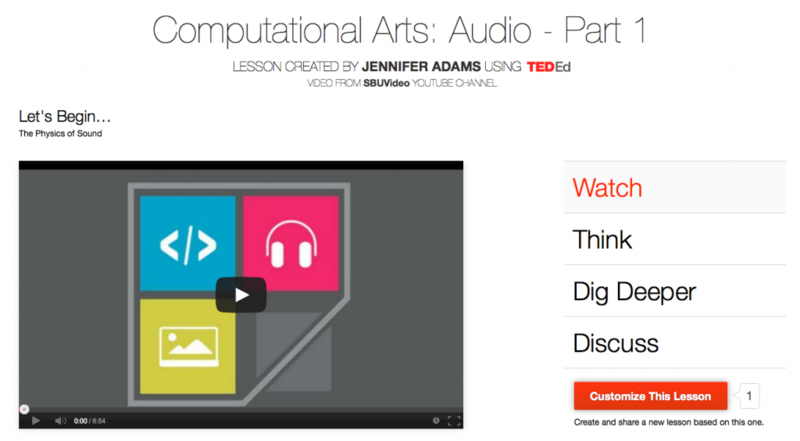 An instructor can create lessons like these, using any youtube video. This is really powerful.